Unfortunately, the series-premiere episode clearly does NOT put the fun in dysfunctional. Whether that means the new TV series, as a whole, is dysfunctional, as well, is to be determined at a later date. 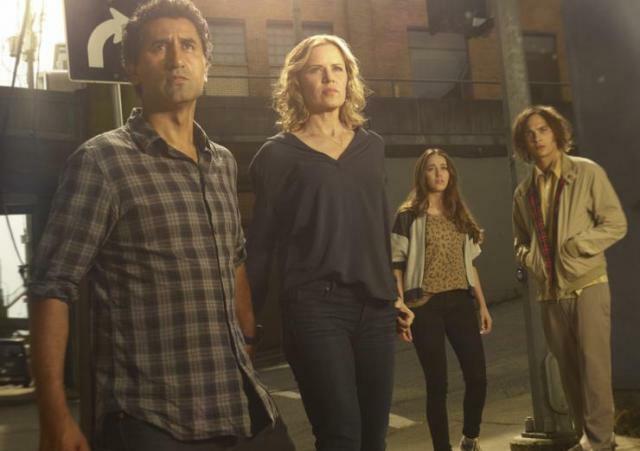 As a spin-off series, Fear The Walking Dead attempts to describe what happened in Los Angeles before the pilot episode of the top-rated television series, The Walking Dead. Here’s a hint: Nothing terribly important. With that line of dialogue, the new AMC TV series should have begun. Unfortunately, there’s way too many peripheral scenes that are simply unnecessary, practically begging for the viewer to hit fast forward. That’s 45 minutes of filler! How can half an episode of unimportant information propel a new TV show? Easy answer: It can’t. While half the episode crawls along, the viewer is “treated” to endless bickering between not one but two families and there really isn’t much happening, noteworthy, whatsoever. Finally, when a troubled child arrives with a knife to protect himself at high school, he reveals reports of a possible airborne toxin that’s already spreading among five states. What’s a kid to do? This is when all the makings of the stereotypical horror movie reveal themselves. Now, there are not one, but two characters who trust no one — especially the authorities — and both are considered to have mental-health problems. Surely, both of them can’t be telling the truth, while everyone else is blind to the surrounding events taking place, can they? Now, the Walkers finally, truly, reveal themselves. This is nothing but uneventful, lazy storytelling. By the time the episode concludes, the actual Zombie Apocalypse will be taking place during the second episode. But what about the first one? It feels like a waste of time and effort. As a pilot, Fear sets the stage for the entire series, but does so without creating characters the viewer has much interest in and creates many long stretches where nothing happens, at all. Where was the editor during all of this? He or she should have been fired, although it could have easily been network intervention. If only those unnecessary scenes were deleted, throwing the viewer straight into the onscreen action, Kirkman and company might have had an even-bigger hit. This series is considered a West Coast prequel that will show the fall of society (and probably the U.S. military turning on its citizens) in future episodes, but not the cause of the outbreak. For now, at least, it’s still a mystery. As foretold on the Talking Dead Season 6 Preview Special, Fear the Walking Dead will take up to two seasons to catch up to the pilot episode of The Walking Dead. New characters are introduced, a weird yellow-palette lighting effect is used and the end of the world is hypothesized. Whatever you do, don’t wear a weird-looking half-shirt during the Zombie Apocalypse. That just looks dumb. On the brighter side, I really like the introductory-screen graphics used for the show’s logo. Sadly, the pilot’s really bad and I don’t have any expectations for the rest of Season 1, but it can only get better from here. Fear the Walking Dead? Unfortunately, the only thing I’m afraid of is the long-term success of this TV show. How many Zombie TV shows is too many? Weakness: …Where nothing really happens. WTF Moment: This must be a flashback: Someone is shown who actually has a working landline phone!